The first mentions about VACUUM can be found at 1994 in the sleeve of Army Of Lovers album "Glory Glamour and Gold". A couple of different (from AOL's previous style) songs (Lit De Parade, Shine Like A Star) were produced by VACUUM. Though at that time VACUUM was not the band, we used to know now. It consisted of just 2 members - Alexander Bard and Andres Wollbeck. They both wrote songs for Army Of Lovers, but at one moment they tired from this band and got the idea to create something new, more aestathic and scientific. There was just one problem: the musicians, which can play and sing live, took the first place in this project. So as Alexander and Andres hadn't time to look for them at 1994, Army Of Lovers used the songs for VACUUM. The songs were recorded with the guest vocalist Vasa from Big Money and became hits in Sweden and abroad. In the future Vasa took part in VACUUM too, writing the songs (Illuminati, for example - see Lyrics Credits for more info). The official date of VACUUM birth is the autumn of 1996. Exactly then Alexander left Army Of Lovers and started to look for the talents for the future project VACUUM. The searching of the members had success in the party in the club, where Mattias Lindblom performed live probably with his band "Ceycamore Leaves". Alexander had thought, that the man with such a powerful vocal would be very and very to the point in the project, so he invited him to the studio and then stole him from his band (which was ready to have a contract with some record company) to take in VACUUM. Then Alexander met Marina Schiptjenko on some TV show. After the talk with her, Alexander found, that Marina would be a good part of VACUUM, and when she said, she had been playing keyboard for about 15 years, Alexander stole her from her band "Page" to make the member of VACUUM. VACUUM started their campaign to conquer the world from the single "I Breathe" released before the album. The single became a super-hit in Sweden and in the Europe, and the videoclip "I Breathe" was called the best video of 1997. Swedish TV channels, such as ZTV, TV4 and TV3 put the video in their music programs and willingly invited VACUUM to have interviews. The coming album "Plutonium Cathedral", where VACUUM used orchestral arrangements and opera solutions, had its contribution to synth-pop and new wave style. So VACUUM started the promotion seriously, and the results were clear: popularity increased, the public demanded live concerts, which came quickly. At those concerts VACUUM followed the conception of minimalism and almost didn't move on the stage. However, the conception of VACUUM was also supposed to have a certain look of the members. So they invited a designer from London, who found the idea of their stylish black clothes, long black nails and make-up (see the pictures in our Photogallery). The next single "Pride In My Religion" brought more success to VACUUM and the band had the first tour to Europe. The one of the indexes of popularity is the material about the band in the Internet. The 1997-1998 were the years, when the different VACUUM and VACUUM related sites were firstly appeared in Internet. The first frequently updated site, which appeared to give us the news about VACUUM, was mixed Army Of Lovers-VACUUM site by David Haglund. In the middle of spring 1998 the Tralala Company opened the official Vacuum Mailing List, which was renamed in VacuumNet and administrated by David Haglund. Then again David Haglund started Vacuum Webring, the ring of the sites, dedicated VACUUM in any way. So as we can see, David played his big role in providing VACUUM to Internet :). Also it should be mentioned Vacuum.fem.ru (vacuum.org.ua in the meantime) for sure, as the very informative, useful and rich resource for VACUUM fans. At the 1999 was appeared the official VACUUM site, but unfortunately it disappeared with band's split-up, being underconstruction. The rest sites of that period you can see at Vacuum Webring. The new, 1998 year started for VACUUM from the releasing "Tonnes of Attraction" single and from promises to release a new, the second album. At that time VACUUM got a really great success in Italy, where was released Tin Soldiers on CD compilation for radiostantions (then it was transformed to the lie rumour about "Tin Soldiers" single). Also in February VACUUM finally performed the next new song called Satyricon from the second album. In a month later fans got the maxi single of "Tonnes Of Attraction", but the album was still delayed for some reasons. VACUUM had been interviewed on TV and in different music editions very often, and at last a small notice about them came to the famous American magazine "Billboard". On MTV "Tonnes Of Attraction" new video had its success, and VACUUM was invited to take part in Swedish festival SEMA (Swedish Electronic Music Awards). A few months after VACUUM released a new single "Let The Mountain Come To Me" promo. Then they had a tour and finally got to the Eastern Europe, visiting Moscow in May 1998 and appeared at the top of Ukrainian charts. Then they returned to Sweden finish a new album. Though then they decided to record new version of "Seance at the Chaebol", and started to re-master old version, which had been already finished. It took much efforts from VACUUM members to record "Seance At The Chaebol" album good, so all the thing were re-recorded for several times, which explained the delay with its release. 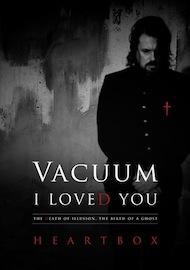 Then VACUUM was going to put new song "Icaros" instead of bonus track "Science Of The Sacred"... Much influence to the album was also made by the trio of the new VACUUM's producers - Denniz Pop, Max Martin and Jacob Schulze (they produced Ace Of Base, E-type, Backstreet Boys and etc. ), so "Seance At The Chaebol" has no orchestral arranges, which were so popular in the first album, and it was clear, that the band made a move to the pop-music side. However, the deep lyrics didn't change. At that time VACUUM got the first problems with Stockholm Records, their record company (about these problems we write below), so although of all the efforts, album "Seance at the Chaebol" was not released in Sweden. Just some countries (as Italy or Russia) got the first old version of this album (without Icaros track and with the old sound). The album had the best success in Russia, so often "Seance at the Chaebol" is called "Russian album". But the popularity in the Eastern Europe had another side for VACUUM. The band met audio piracy. As we know, the audio piracy has a wide success in the Eastern Europe, but VACUUM didn't suspect about it before they came to Baltic countries with a tour. The band couldn't understand, how they can be popular in the countries, where the sale of their (original) CDs had just about a hundred copies. The situation was very difficult for VACUUM, especially in Russia, where were sold about 8 millions of illegal records. Just could you imagine, how much money VACUUM would get if they sold so much original CDs?! Lets count: usually illegal record costs from 2 to 5 euro. We take average number 3,5 euro and multiply it to 8 millions. It will be 28.000.000 euro. The money, which VACUUM didn't get. Yes, with piratical records VACUUM became number 1 in Russia and Ukraine, BUT also had a big strike to their financial means, and maybe because of it VACUUM came to the dark pages of the history. 1999 year started for VACUUM from the Alexander's leaving. He was interested in his new project Alcazar and his book, so had no time for VACUUM anymore. Though 2 guest players were invited to replace Alexander in music part. With those 3 guys VACUUM came to Estern Europe again to visit Ukraine in March 1999 and Russia. Although the all Mattias' and Marina's words, that "Alexander is still a part of VACUUM and continues to help them with music and texts", it was not true, as after 1999 Alexander hadn't written anything for VACUUM at all. So there was some crisis with materials for VACUUM at that time. The new alliance Wollbeck/Lindblom was just in the beginning of its creation, so VACUUM of 1999 period gave us just 2 new songs "Tears" and "My Melting Mood" ("Icaros" had already been performed in 1998 with Bard). And also right after Alexander's leaving VACUUM got problems with Stockholm Records. No doubts, that Stockholm Records understood, that if VACUUM has popularity, it is more in the Eastern Europe, where, because of audio piracy, a normal record-company can't have big money. So probably VACUUM was called non-perspective band and the contract between SR and VACUUM was broken. The new promised "Swedish" version of "Seance At The Chaebol" (loudly called album "Culture of Night") was produced by absolutely different companies (Epicentre, Cheiron, Sony), and at last was released just in Russia again. Maybe this also had its influence to the situation that this version appeared just as a compilation of the old hits with 2 re-mastered and 3 new songs, which had never been released officially before. Just one of them "My Melting Mood" belonged the alliance Wollbeck/Lindblom. "Dear friends! Heard from David, that you are talking about a split of VACUUM. Well, it's true in one sense! We have left Stockholm Records. Why? Well, it's a long, quite boring story, but in short we disagreed on everything. That's a good reason! We are currently working on different projects and we have are not focusing on VACUUM right now except the live-shows. But we want you to know, that we have NOT split up and you will see more of us in the future. We also want to add, that if we had had a record-company, who believed in our ideas and music, we would have continued, but as things turned out we had not. We have enjoyed big-time success in Russia and Marina and I have loved every second of it and we hope to perform live soon again. We will keep in touch with David in everything, that we do, so he will keep on feeding you info. Mattias & Marina + VACUUM crew"
There were no any promised live shows from VACUUM then, but was a rumour about solo carrier of Mattias - in romantic pop style. It is unknown, what would be then with VACUUM, but the company, who had believed in the band, was founded. Such a company appeared Subspace Communications. Mattias and Marina had already known this company, because the previous Marina's band Page recorded and records its CDs there, and also Johan Malmgren (guest player in VACUUM'99) is also the artist of this company. So when SSC had offered VACUUM to work together, Mattias and Marina started to work in the studio. 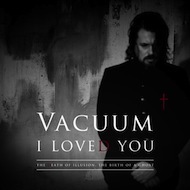 And after some time the VACUUM fans have got a new VACUUM single. At the 6th of May 2002 a new single of VACUUM "Starting (Where the story ended)" were officially released after 2 years of silence. The title of the single says, that VACUUM starts a new history after the ended period with a new record company, new ideas and new music. And the band started their new history really right there, where it was ended, so it was not a phrase in the figurative sense: "Culture Of Night", which had so much bad luck in 1999, was re-mastered again and at last released in VACUUM home Sweden and other Scandinavian countries in the 14th of October 2002. Although there was no so much time after VACUUM resurrection, the band has been already invited to some live shows (Stockholm Pride 2002, Malmo Gig) and on TV. But on some of the performances Mattias appeared with a guitar player (who was called VACUUM member too, according Mattias' recent words on TV4) instead of Marina. What can I add to this history? Just one thing: wish Vacuum to not only start, where the story ended, but to continue, where they have started again. Good luck! but with the link to Vacuum-Music.com, ok?